In 2006, member States took a significant step towards strengthening the human rights pillar of the United Nations by establishing, with General Assembly resolution 60/251, the Human Rights Council. Since then the Council has grown significantly in confidence and stature, positioning itself as a relevant and influential political body in the multilateral arena, and has registered important achievements at both a thematic and a country-specific level. Established Council mechanisms, especially Special Procedures, have continued to expand in scope and sophistication, while a new mechanism – the Universal Periodic Review (UPR) – has seen the human rights record of every single UN member State scrutinised, thereby strengthening universality, inclusivity and dialogue. While recognising these and other achievements, it is important to recognise that there are also areas where the Council has fallen short of its mandate and objectives. For example, the body has been criticised for focusing too heavily on general thematic issues and debate, while remaining silent on many serious human rights violations, including gross and systematic violations. Other critics point to deficiencies in the domestic implementation of resolutions, decisions and recommendations made by the Council and its mechanisms, and insufficient progress in effectively mainstreaming human rights across the UN system. As the Council looks towards its 10th anniversary in 2016, it is important for stakeholders to take a step back and make an honest appraisal of the body’s achievements and challenges, and work together to identify new and innovative solutions to equip it to better meet those challenges in the decades to come. In this spirit, on 5th and 6th May 2015, the Governments of Norway and Switzerland, supported by the Universal Rights Group (URG), hosted a second two-day retreat in Glion, Switzerland, designed to provide an informal, non-attributable platform for forward-looking and solutions-focused discussion on how to strengthen the relevance, effectiveness and impact of the Council. This year, three informal policy dialogues, organised by the URG in cooperation with the Permanent Missions of Mexico, Thailand and Morocco, preceded the Glion retreat. These policy dialogues were designed to promote the participation of a wide range of States, NGOs, UN officials and experts in discussions about the future of the Council. The dialogues allowed for an initial consideration of key challenges and the provisional identification of possible solutions. The present document is an informal report summarising (in a non-attributable manner) some of the key ideas developed during the Glion retreat and based on the three policy dialogues. The document does not represent the position of Norway or Switzerland, nor any of the participants, but rather is a non-exhaustive collection of ideas generated during those meetings. 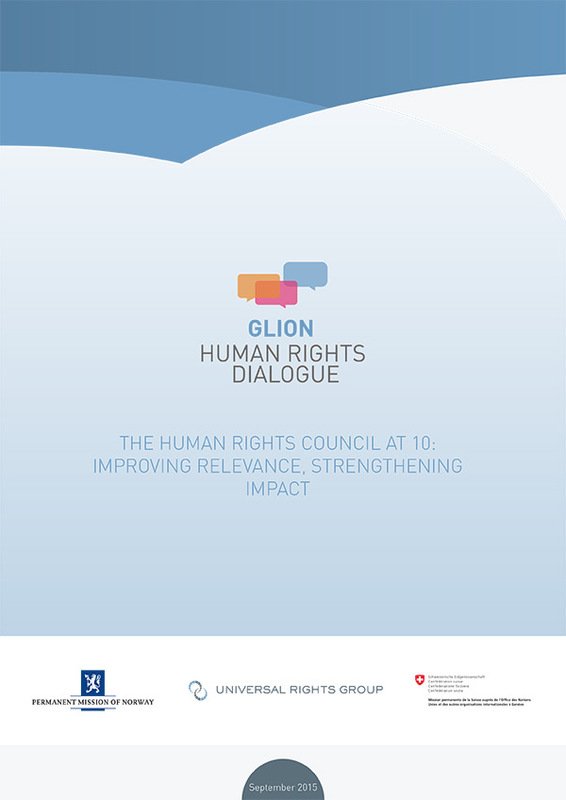 It is the hope of the organisers that these ideas and proposals will encourage and contribute to wider consideration by all stakeholders from all regions, thus making the Glion Dialogue a starting point for a fruitful and inclusive process. It is also the hope of the organisers that, where appropriate, States and other stakeholders will take forward useful ideas generated in Glion and thus contribute to an improvement in the Council’s relevance and impact. The report is divided into four parts. The first presents ideas generated during the opening plenary of the Glion Dialogue, which considered ‘big picture’ questions relating to the Council’s performance since 2006, and how the body’s relevance and impact might be strengthened in the future. The next three sections then present key ideas generated during the three policy dialogues and the more focused discussions in Glion on: the operation of the Council – how to better deliver on its mandate; strengthening implementation and impact on-the-ground; and the Council’s relationship with the wider UN system, and the mandate-resource gap.